At Intel, “Innovation is everything.” The words of Intel co-founder Robert Noyce were true in 1961 when he received a patent for the integrated circuit, in 1968 when Intel was founded, and in the nearly 50 years since. The result has been Intel patents for foundational technologies such as the single-chip microprocessor, memory management and countless others. In total, Intel owns more than 90,000 worldwide patent assets covering a wide range of technologies from semiconductor manufacturing to wireless networking. And last week, with 3,414 patents granted in 2016, the Intellectual Property Owner’s Association (IPO) recognized Intel as ranking No. 4 on its annual list of the top 300 U.S. patent recipients. Intel’s unrelenting commitment to innovation has kept Moore’s Law alive over the past half-century. Moore’s Law, in turn, has unleashed growth benefiting many industries and creating others. The strength of Intel’s patent portfolio is a testament to this unwavering investment in innovation. From 2005-2016, Intel spent more than $100 billion in R&D, spending $12.7 billion in 2016 alone, and yielding 55,000 granted patents for Intel. With its steadfast leadership in R&D, Intel developed new microarchitectures and advanced silicon manufacturing processes, and outpaced our peers with Intel’s 14 nanometer (nm) technology. But the most important impact of Intel innovation goes far beyond silicon. By selling and licensing our technology, Intel enables and powers the most sophisticated computers, data centers, sensors and other high-tech devices in the world. Together with our industry partners, we’re advancing amazing innovations in artificial intelligence, 5G, autonomous driving and virtual reality that are transforming the way we work and live. 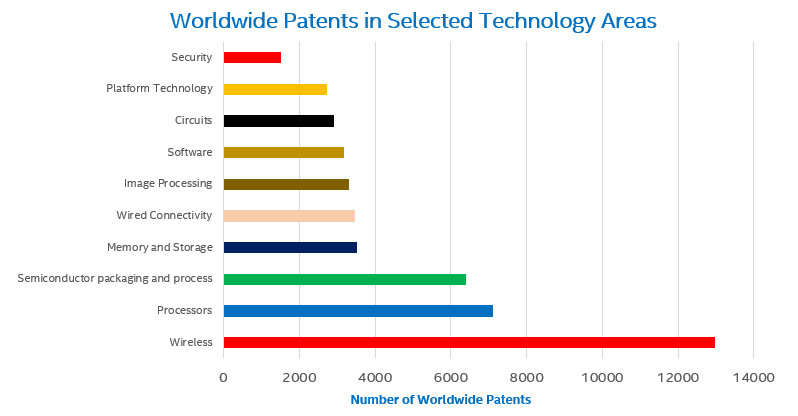 Intel protects these diverse technological innovations with broad patent coverage, as shown in the chart below. Intel owns thousands of worldwide patents in technologies ranging from circuits and processors, to software, image processing and other AI-related areas. To anybody familiar with Intel’s world-class leadership in silicon manufacturing, it will come as no surprise that Intel’s patent portfolio contains over 6,000 patents related to semiconductor packaging and process technology and over 7,000 related to processor technology. Intel also owns nearly 13,000 patents on wireless technology. Another strength of Intel’s patent portfolio is its wide geographical footprint. Intel’s international patent portfolio includes 4,700 patents granted in China, and tens of thousands in Europe. Intel’s European portfolio includes 11,000 granted German patents, over 2,000 in France, and nearly 1,000 in the Netherlands. Indeed, Intel has been among the top 10 non-European filers in the European Patent Office for the past three years. Intel also was the No. 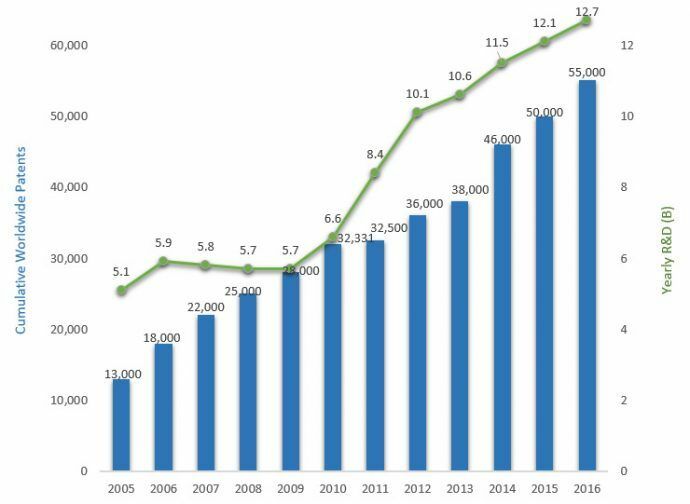 1 patent filer in Taiwan in 2015 and 2016 and also has been consistently one of the top 10 U.S. filers in China over the past six years. Moreover, Intel has been granted patents in over 50 countries around the world. Intel’s patent portfolio spans from Argentina to Vietnam, with many stops in between including Australia, Japan, Russia and South Korea. In addition to its technological and geographical breadth, the Intel patent portfolio boasts a diverse pedigree of accomplished inventors. In 1971, two Intel inventors were granted patents. To date, over 19,000 U.S. inventors have been granted at least one U.S. patent. But Intel’s innovation is not limited to U.S. inventors. Fifty-seven current or past Intel inventors, from over 40 countries, have been granted over 100 patents each. And Intel has a deep bench: Nearly 5,000 Intel inventors were granted one or more U.S. patents in 2016. Moreover, Intel carefully protects its industry-leading advances with high-quality patents. Many of these patents have durability because semiconductor, hardware and wireless inventions are often persistent, remaining important components of products for decades. The high quality of Intel’s patents has been recognized by many industry organizations including The Wall Street Journal, the Institute of Electrical and Electronics Engineers (IEEE), Intellectual Asset Magazine, Ocean Tomo, and the International Legal Alliance Summit & Awards (ILASA). Robert Noyce was right when he said, “Innovation is everything.” At Intel, we are committed to innovation and protecting our inventions.